Yes, the time has arrived to back off the intensity and volume of training to start preparing for the big day. 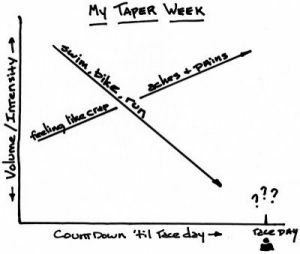 Here is a couple of things to think about the days or weeks leading into race day. Nutrition/Diet-Be diligent at taper time your body is used to a higher volume of exercise and intensity so you can get away with a few diet slip ups here and there, the odd piece of slice or extra scoop of ice cream, because you know more than likely you’ll easily burn it off during your next session. During taper you are accustomed to this mind set making it easy for you to continue eating the way you have been during peak training phases. It would be terrible to rock up on the start line with an extra couple kilograms to tow around, so be mindful about what your eating especially at taper time. Intensity-Just because it’s taper time doesn’t mean every session from now on is at aerobic pace. Don’t get to complacent some speed work still needs to be done in order to keep the engine firing. I was once told you still need a bit of sting in the legs on race day. I didn’t understand it for a long time, but over the years have learnt that having to many light days made me feel lethargic and slow come race day when asking my body for the extra revs it just wasn’t there. Visualisation-Use the spare time to visualise your race go over and over the race in your head, prepare mentally. It’s not just physical. This may help to calm the nerves as the mindset changes from training for an event to performing on race day. Taper is different for everybody. It may take some trial and error to get right be smart about it, don’t do anything out of the norm and enjoy the down time.